Bloodlines goal is to produce a complete American Bulldog having the type, temperament, drive, structure and soundness that an American Bulldog should have. Many kennels have successfully our dogs as their foundation and continue to do so to this day. IStacy’s commitment in working, training and showing, Bloodlines is not only producing great bulldogs they have the champions to prove it such as Shiner, Argus, Twisted Sister, Cinnamon, Bo Diesel, Phoenix and many more. Keep checking our produced page for more upcoming Champions. Stacy Granger has been with this breed since 1997, he hasn't done a lot of breeding in fact, His breeding that produced Sugar was only his second breeding of the American Bulldogs. He feels he hit a home run on that one. Most of his breedings have been done for himself and pups from them where sold or given away locally as pets. He says he's more into showing the dog than breeding the dog. He has always had his friend and Mentor Wil, to confide in about breedings he wanted to do. He had bred Boxer's and Dobbies before coming over to the American Bulldog. Wil Barbosa has said " Stacy has a way of Raising dogs as if they where his own children...He has the time, energy and ability that is needed in giving these bulldogs the Social Skills and training needed that makes them excel in working and showing events." "I get a kick out of watching one of our babies do well when I take them to the shows, I do the showing and Public Relations end and Wil's the scientist...HA HA!" 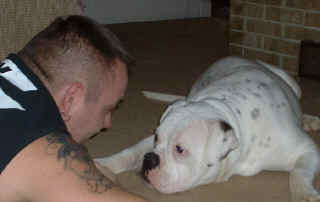 Bloodline American Bulldogs is striving to better this breed and will continue to do so for many years to come. Thank you for visiting and we hope you enjoy our site and dogs as much as we do.